We made it through our first week of summer vacation and so far the only "real" school thing we've done is a 2-3 minute math review each day. 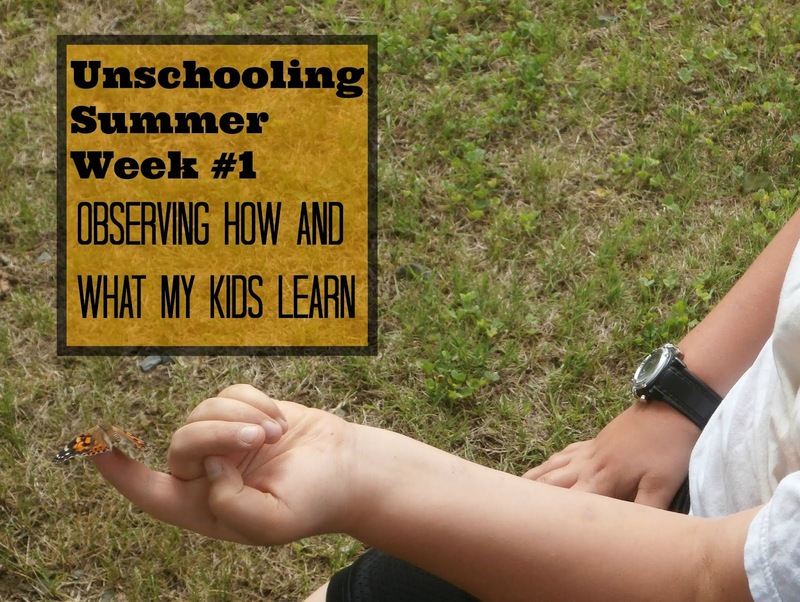 After re-acquainting myself with all the unschooling rationals that started us on this homeschooling journey I prepared to sit back and observe this week. I was prepared for them to sit and watch TV and play video games to their hearts content; after all this is vacation. I was determined to allow them to fill their downtime any way they wanted. They did have to do some chores, run some errands with me, and I occasionally might have asked one of them to pick up a book and read something but I tried to allow them to find their own way. Looking back over the week they sure learned a lot. They reviewed and built on previous skills. Most importantly they had a great time. Math-- Watching Ian learning how to play Cribbage and Pitch I was struck by all the math involved in these simple card games. He had to apply math skills and learn all the rules of both games. He became our score keeper and added using negative numbers. Alec soon joined in with playing Pitch and in one small demonstration took over adding up all the "game" points because he thought it was great fun. All three boys spent some time this week adding up their money and looking through the science center gift shop and on Amazon to see what they could spend their money on (though they all decided to save it for a later date). Ian and his cousin spent some time playing darts and adding up their scores quickly; comparing them to see who won each round. Science-- All of our butterflies hatched out of their chrysalis' this week. We fed them a sliced orange and watched them build up their strength in their wings as the days went on. We occasionally saw a proboscis as one butterfly or another took a sip of the juice. We also checked on our ladybugs and watched them munching on raisins. We spent a day at The Children's Museum and the boys had lots of hands- on science learning. They learned about Nano worlds, animals & their habitats, electricity, optical illusions, and so much more. Since Ian has been having such great luck with the orange seeds he planted he tried planing a peach pit in a cup of dirt this week. We're anxious to see if anything grows. The boys found another baby turtle and rescued him from a hole in our yard, bringing him back down to the water. We've enjoyed watching the geese with their babies, the ducks, the heron and all the other birds we've seen around our house and yard too. Reading-- We read the next several chapters in The Phantom Tollbooth and we listened to our book on CD whenever we were in the car. The boys have read various things throughout the week too. Alec in particular has been reading multiple chapters each day in a few different books, as well as several whole books-- Warriors, Confronting the Dragon (which he's been reading to Evan), the next two book in the Amulet series & All the Cats of Cairo; just to name a few. Evan has been reading some picture books to me here and there. This week we've read Biscuit Goes Camping, I see, You saw & Chicken said, "Cluck." He's also been reading signs and labels wherever we go. Ian and I have continued reading chapters in Catching Fire and he has re-watched the movie to compare it with the book. He also has started reading My Weirdest School: Mr. Cooper is Super! Physical Education-- They all started exercising with my husband after dinner using some weights and the treadmill. They ran around playing outside. They rode bikes and scooters. They spent some time practicing karate this week (all three of them!). They want to remember all of their forms for when they join back up in the fall. They played on the playground using monkey bars, swings, slides and chasing their friend around. History-- Alec continues to immerse himself in Greek Mythology and shares frequent stories with us about the gods and goddesses while we listen to The Serpent's Shadow. We read about various scientists and their contributions to their fields while at the Children's Museum. Social Skills-- It's laughable among homeschoolers but many people worry about our children's social skills. I'm pretty sure it's apparent from reading my blog that we come into contact with people A LOT! Just this week my kids made friends with some other kids they met at the Children's Museum, we went to visit my grandmother, we had friends & family over our house to play, and we met up with lots of other homeschoolers at a park for some fun. They also talk to all the librarians, check out clerks and adults we run into too. Life Skills-- my kids have helped clean the entire house top to bottom this week. They each cleaned bathrooms and toilets, vacuumed, swept, washed floors, washed clothes, dusted and did their regular daily chores. Their regular chores include setting and clearing the table, taking out the trash, washing the table and counters, sweeping and washing the kitchen floor. They also make their own breakfasts and lunches most days. My kids are responsible for keeping their rooms cleaned, their beds made and taking care to clean their bodies and teeth. We have frequent talks about nutrition, drug and alcohol use, safe driving, etc. Ian has a few odd jobs and helped mow lawns this week to earn some spending money. It's become his new summer job and he's working hard at it every week. Art-- We saw a few examples of oil barrel art at the science museum. There were decorated oil drums; one was covered in sewn quilts, one was turned into bike's, one or two were painted with scenes. Evan was most impressed with the barrel art that depicted a world on fire and that prompted him to start singing the first few lines of the chorus from We Are Young. We also looked at a lot of the photography lining the walls of the museum. Weird, Unsocialized Homeschoolers Weekly Wrap- Up.